LDAP authentication is a feature specific to Enterprise-level license holders. You must have an active enterprise license before beginning the configuration process. Additionally, if the LDAP server you want to connect to has a certificate that is self-signed or signed by a corporate internal certificate authority (CA), the CA certificate must be added to the system’s trusted CAs. Otherwise, connection to the LDAP server will result in an error that the certificate issuer is not recognized. Administrators use LDAP as a source for account authentication information for Tower users. User authentication is provided, but not the synchronization of user permissions and credentials. Organization membership (as well as the organization admin) and team memberships can be synchronized. When so configured, a user who logs in with an LDAP username and password automatically gets a Tower account created for them and they can be automatically placed into organizations as either regular users or organization administrators. Users created via an LDAP login cannot change their username, first name, last name, or set a local password for themselves. This is also tunable to restrict editing of other field names. First, create a user in LDAP that has access to read the entire LDAP structure. Here CN=josie,CN=users,DC=website,DC=com is the Distinguished Name of the connecting user. The ldapsearch utility is not automatically pre-installed with Ansible Tower, however, you can install it from the openldap-clients package. From the left navigation bar, click the Settings ( ) icon. In the Sub Category field, select LDAP from the drop-down list. The equivalent API endpoints will show AUTH_LDAP_* repeated: AUTH_LDAP_1_*, AUTH_LDAP_2_*, ..., AUTH_LDAP_5_* to denote server designations. If that name is stored in key sAMAccountName, the LDAP User DN Template populates with (sAMAccountName=%(user)s). Active Directory stores the username to sAMAccountName. Similarly, for OpenLDAP, the key is uid–hence the line becomes (uid=%(user)s). Click to select a group type from the LDAP Group Type drop-down menu list. The LDAP Group Types that are supported by Tower leverage the underlying django-auth-ldap library. To determine what parameters a specific LDAP Group Type expects. refer to the django_auth_ldap documentation around the classes init parameters. Enter the group distinguish name to prevent users within that group to access Tower in the LDAP Deny Group field, using the same format as the one shown in the text field. In this example, leave the field blank. The LDAP Start TLS is disabled by default. To enable TLS when the LDAP connection is not using SSL, click the toggle to ON. The first line specifies where to search for users in the LDAP tree. In the above example, the users are searched recursively starting from DC=website,DC=com. SCOPE_ONELEVEL: This value is used to indicate searching all entries one level under the base DN - but not including the base DN and not including any entries under that one level under the base DN. 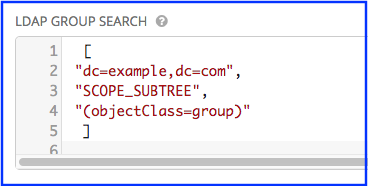 SCOPE_SUBTREE: This value is used to indicate searching of all entries at all levels under and including the specified base DN. The third line specifies the key name where the user name is stored. The first line specifies the BASE DN where the groups should be searched. The second lines specifies the scope and is the same as that for the user directive. The third line specifies what the objectclass of a group object is in the LDAP you are using. The above example retrieves users by last name from the key sn. You can use the same LDAP query for the user to figure out what keys they are stored under. The above example retrieves users who are flagged as superusers or as auditor in their profile. For details on completing the mapping fields, see LDAP Organization and Team Mapping. With these values entered on this form, you can now make a successful authentication with LDAP. Tower does not actively sync users, but they are created during their initial login. “Referrals” are disabled by default in Ansible Tower version 2.4.3 and above. If you are running an earlier version of Tower, you should consider adding this parameter to your configuration file. Next, you will need to control which users are placed into which Tower organizations based on LDAP attributes (mapping out between your organization admins/users and LDAP groups). Keys are organization names. Organizations will be created if not present. Values are dictionaries defining the options for each organization’s membership. For each organization, it is possible to specify what groups are automatically users of the organization and also what groups can administer the organization. If None, organization admins will not be updated based on LDAP values. If True, all users in LDAP will automatically be added as admins of the organization. If False, no LDAP users will be automatically added as admins of the organiation. If a string or list of strings, specifies the group DN(s) that will be added of the organization if they match any of the specified groups. remove_admins: True/False. Defaults to False. When True, a user who is not an member of the given groups will be removed from the organization’s administrative list. remove_users: True/False. Defaults to False. Same rules apply as remove_admins. belongs. The team will be created if the combination of organization and team name does not exist. The organization will first be created if it does not exist. If True/False, all LDAP users will be added/removed as team members. If a string or list of strings, specifies the group DN(s). User will be added as a team member if the user is a member of ANY of these groups. remove: True/False. Defaults to False. When True, a user who is not a member of the given groups will be removed from the team.